Today Huzur delivered his faith-inspiring Friday Sermon on the importance of missionaries and life devotees, the need for cooperation and understanding between between missionaries and office holders and the vital need for all to walk hand in hand to help towards a united endeavour to help the progress of the Jama’at. Huzoor (aba) stated that it is through the grace of Allah the Almighty that Jamia Ahmadiyya has been established in several countries throughout the world. Missionaries graduate from here and subsequently they are assigned different tasks. Originally Jamia Ahmadiyya only existed in Qadian and Rabwah. In recent days a joint convocation ceremony took place with students from Jamia Ahmadiyya UK and Jamia Ahmadiyya Canada. These graduates are such that they have chosen to dedicate their lives for the service of the faith, despite growing up in a western environment. The majority of them if not all are part of the Waqf-e-Nau scheme. Aside from Rabwah and Qadian, Jamia Ahmadiyya are established in the UK and Germany, where students from European countries have the opportunity to study. Furthermore, the Jamia Ahmadiyya in Canada is officially recognised as an educational institute and as a result students from other countries are eligible to attend. There is a Jamia Ahmadiyya in Ghana, where this year the Shahid [Final year] class will graduate. Also there is a Jamia Ahmadiyya in Bangladesh and the the Jamia Ahmadiyya in Indonesia has been extended to incorporate the Shahid [a seven year degree in order to become a missionary] course. When these young missionaries begin their field work they have certain questions in their minds and the reason why they must be addressed here is so that the office bearers of the Jamaat understand that it is important for them to work with mutual harmony, i.e. the Missionaries and the office bearers should cooperate with one another; especially presidents and Ameers (national president). On occasions disagreements can occur which are often a result of some misunderstandings and they can cause friction between the two parties. It may be the case that sometimes a missionary is able to envisage a certain aspect from a moral point of view and wishes to implement a scheme in his locality, however the Sadr [head of the local community] disagrees with him. Or it may happen that owing to a lengthy term in office, a Sadr thinks that his plans are correct and the missionary should work under him. Alternatively, in an open gathering he may demand answers from the missionary in a manner that is inappropriate. It is possible that the missionary may dislike this conduct may even answer back. However I would like to remind the Missionaries that they must always obey those who are placed in authority over them and they must demonstrate a high standard of obedience by remaining silent. At the same time I would like to address the Sadraan and Umarah and remind them that it is their responsibility to show respect and for them to ensure other people show respect to the missionaries. They should work together as one in matters of righteousness and piety. It is observed that in minor misunderstandings between the president, missionary and office holders, satan enters the fray to try and shake the foundations of righteousness of everyone concerned. Those whom the president and missionary are meant to help reform, try to create a wedge between these two and incite them against one another by telling them that they have been wronged by the other. Ultimately this tension causes anxiety amongst the people. The Promised Messiah(as) said that no community can remain a community who are always trying to devour, back bite and find faults against one other. He said we should become as one as our strength lies in our unity. And that we should increase our scope of morality, which can be achieved by spreading more love, brotherhood and compassion. Huzur said that missionaries and office holders should adopt the habit of covering the faults of others and showing mercy and forgiveness and they should be role models in displaying these traits. They should not become enraged on the pettiest of matters and develop grudges as a result. 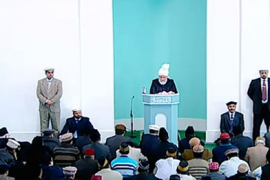 Huzur clarified that by presenting these extracts he does not, God forbid, infer that there are widespread disputes in general in the Jamaat between the missionaries, and the presidents and Ameers. This is absolutely not the case. There are just a handful of such cases that are brought to Huzur’s knowledge each year. Huzur said the reason he is addressing these issues forthrightly was so that the presidents and Ameers as well as the missionaries realise the huge scope of their tasks. And so that if any disagreements arise between them they can be immediately resolved. Ultimately they should understand that they have a mutual objective and need to work in parallel to fulfil their responsibility to train and help reform the members of the Jama’at. As the Promised Messiah(as) once said, work that can be accomplished with two hands can never be replicated by using just one hand. Our success lies in our mutual cooperation and working together to a common goal. What can one single person do in either worldly or religious matters as compared to a large community who work hand in hand to reach a shared objective? Neither should an Ameer implement orders purely according to his wishes, nor should a missionary consider all his views to be undeniably correct. A missionary’s role is to help train and reform the Jama’at and so a missionary’s level of righteousness should be at a higher level than the members. Setting this standard will naturally form a level of respect for missionaries amongst the general membership. The Ameer being the administrative head within his country is tasked with ensuring the system and administration runs smoothly and is the Khalifa’s representative in this respect. The missionaries role is to strive for the religious and spiritual betterment of all members and is the representative of the Khalifa in this perspective. The Ameer, presidents and missionaries must thus all work together under a united platform to achieve this goal. Huzur said he will once again reiterate that it is the obligation of all Ameers, presidents and office holders to show respect themselves and instil respect in the Jama’at for all missionaries and life devotees (Waqif-e-Zindagis). This will also inspire the youth to wish to dedicate their own lives to the services of the faith. Indeed one only dedicates their life or becomes a missionary to please God. However sometimes the children and youth need a visible motivation to inspire them to initially take the gradual steps of devoting their whole lives. Once they fully understand and the true purpose of their life dedication then spiritual progress is achieved and he will shun materialism. All Ameers, presidents and officeholders should therefore deal with missionaries and life devotees with utmost humility and cooperation so that it makes our task of acquiring new missionaries easier. We need many more missionaries and life devotees and so it is absolutely imperative that we establish a respect and regard for them in the hearts of all. Huzur said he would like to address all of the young life devotees and missionaries currently serving that regardless of whether the world shows them respect or not, whether an Ameer, president office holder of in fact any member of the Jamaat gives them due respect or not, they should in any case fulfil that pledge of sacrifice they made with Allah the Almighty. Missionaries should look to God and not the world for all their problems. If an office holder does not treat them right then instead of expressing this to other people, a missionary should submit his problems to God in prayers. The missionary should not worry about people but rather should simply pray to God alone. Indeed, a Life devotee will serve in the Jama’at for life whereas officeholders are elected for a short term. When an office holder is not carrying out his duties properly and only creates problem, the missionaries response should be to pray that the office holder treads on the right path or that God the Almighty separates such office holders. Huzur addressed missionaries and office holders and said that if they expected the members in their homes to refrain from speaking ill about office bearers, then missionaries and office holders would have to first ensure back-biting of officials is not occurring within their own houses. All office bearers, particularly Presidents and National Presidents, must always treat the members of the Jama’at with great love and affection. They must remember that this office is purely due to the blessings of Allah the Almighty and they have no rightful claim to it. Therefore, they must discharge this trust which the Khalifa of the time has placed upon them with utmost humility. According to the Ahadith, the Holy Prophet(sa) would always greet people with a smile thus the noble example of the Holy Prophet(sa) should always be kept in mind. Some people complain that that their affairs are sent to the Jamaat administration but months pass by and they do not receive any update of its progress. Huzur said that he has mentioned this on previous occasions also that maters should not be unnecessarily prolonged and should be resolved as quickly as possible. If a certain case requires more time then the concerned parties should be updated of the progress and their queries should be acknowledged. The Holy Prophet(sa) has reminded us to not deem any act of virtue insignificant because even greeting someone with open-heartedness is a virtuous act. If office bearers address members of the Jama’at with a smile and open-heartedness, this alone can alleviate half of their grievances. Every action and decision of the office bearers should be done while instilling the fear of Allah, adopting humility and fulfilling the requirements of justice. The Holy Prophet(sa) once stated that Allah the Almighty will never let a person enter heaven who is made responsible for people and yet is neglectful of his duties. The Holy Prophet(sa) on another occasion stated that on the Day of Judgement, a just ruler will be the most beloved and closest to God Almighty and an unjust ruler will be the worst in the eyes of God Almighty and will be kept furthest from Him. Thus, the office bearers must fulfil their responsibilities and this applies to all the auxiliary organisations also. The reason why Hazrat Musleh-e-Mau’ud(ra) established these auxiliary organisations was so that every member of the Jama’at could be reached out to. The National Amir, local presidents and the auxiliary organisations should all work with a mutual corporation and this will increase the overall progress of the Jama’at by manifolds. Office bearers should display the most courage and even if a complaint is made against them, they must not seek to exact revenge and instead they should asses themselves whether or not that flaw is found in them and reform themselves. This also comes under the requirements of justice and fairness. Every member of the Jama’at should also try and increase their level of Taqwa [righteousness] as they too have been instructed to help one another in righteousness and piety. They must evaluate themselves in regards to their Taqwa and piety. Each member of the Jama’at must fulfil their duties in regards to obedience because their models of obedience will not only enable them to strengthen their bond with the Jama’at but also enable their progenies to remain attached to it. If the future generations’ level of Taqwa and piety are high then naturally the office bearers of the future will have high standards of Taqwa and piety. Thus, members of the Jama’at should inculcate the instruction of the Holy Prophet(sa) into their hearts and also into their children that they must show obedience regardless of the circumstances. One should always pray that may Allah the Almighty appoint such office bearers who treat them with love and affection and pray for them and they too have love for them and also pray for them. The Holy Prophet(sa) stated on one occasion that He will bestow His mercy on the Day of Judgement upon those who love one another for His sake. Huzur prayed that may Allah the Almighty enable everyone to fulfil their responsibilities which have been placed on them after joining the Jama’at of the ardent devotee of the Holy Prophet(sa) and may they live up to the expectations he has from them. The Promised Messiah(as) once stated that Allah the Almighty desires to create a Jama’at which should become a model for piety and righteousness. Their levels of truthfulness and humility must be extremely high and they should be pure natured and avoid gatherings where people mock and deride one another. May Allah the Almighty enable every member to act in this way and become the recipients of Allah the Almighty’s Mercy.